There are some good elements to this comic but the whole is disappointing. Great character work can't disguise the lack of threat required for this sci-fi horror story. A dip in the expected standard from this creative team. Continuing the saga of the Xenomorphs and the rebellious nature of humankind, Aliens Resistance #3 from Dark Horse Comics finally pits the heroes against the Aliens. Finding the balance between character relationships and action is a difficult task, especially on a franchise like Alien where certain expectations need to be met. Passing the halfway point of the series, the current creative team have a lot of elements to play with but can they keep all of those balls in the air? Lost in space and orbiting a moon with a secret Company science station, Amanda Ripley and Zula Henricks must put their faith in each other to survive and face the horrors ahead. 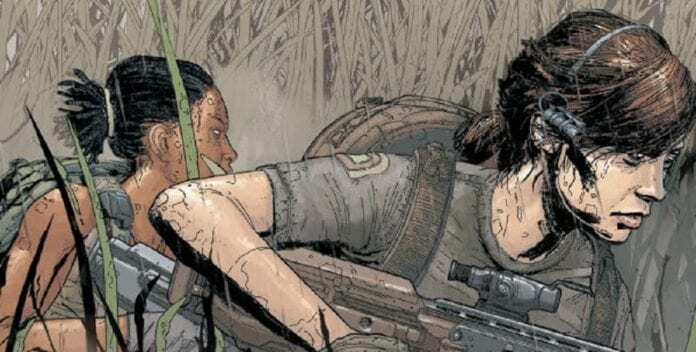 The opening sequence of Aliens Resistance #3 is an adrenaline rush that Brian Wood uses to illustrate the bond developing between the two central women. This bond is the main motif of the issue and throughout Wood focuses the dialogue on the closeness between the two of them. The ease of which they speak to each other and the jokes/sarcasm they share accentuates their friendship. Elsewhere in the comic, Wood finally reveals the horrific nature of the experiment undertaken by the Weyland-Yutani. 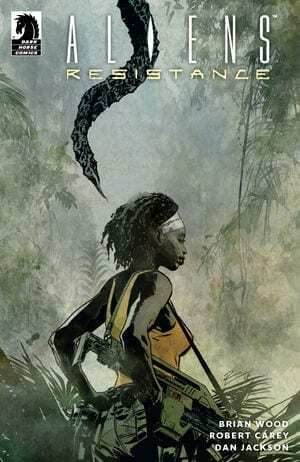 Set in a jungle environment, Wood uses the voice over to highlight the hopelessness of the colonists. The sequence is quick and bloody. In fact, it’s too fast. Anticipation of the moment is at a high by the time the reader gets to this section of the comic and then it’s over, almost straight away. Wood doesn’t allow the horror of the situation to sink in. Amanda and Zula are a great duo and their friendship is the central part of Alien Resistance but this comes at a cost. The rest of the comic lacks for characters and therefore lacks any element of threat. Just as the story focuses on character, so too does the art work. Robert Carey produces outstanding figure work giving the central characters a very strong presence on the page. The cast also perform well, expressing fear or relief as the narrative requires. The page layout and scene setting is also exceptional. Each scene has a wide, cinematic look; the depths of space are endless and the jungle landscape over bearing. Wood’s slow pacing matches the vastness of the scenery and the expansive panels Carey uses to contrast the characters relationship against the all-encompassing space they inhabit. This layout reinforces Amanda and Zula’s need to work together and be a strong partnership; alone they would simply disappear. The problem with the art lays in the blending of the characters and the backgrounds. Similar to the first Star Trek Discovery comic from IDW Publishing in 2018, the characters and the background seem to exist on two separate planes. The one layer has been placed over the top of the other but there is a distance between the two. This results in breaking the reader’s concentration making it difficult to retain the atmosphere. The color work by Dan Jackson is excellent, especially on the backgrounds. He creates a sense of depth that is unnerving. The lettering by Nate Piekos is also first rate as it is always clear who is speaking, even in the caption boxes or through the radio communications. However, the problem with the foreground and the background is an issue. The lettering is clearly on one level with the characters, separated from the scenery they are supposed to be inhabiting. The recap page gives away half of this issues’ story and could cause confusion if you’ve read previous issues of Aliens Resistance. In turn this means that the narrative is constantly playing catch up with the reader and fails to meet expectations. The build-up in the previous issues and the promise of a mass xenomorth infection doesn’t come to full fruition. The Aliens have been side-lined and appear all too briefly. Aliens Resistance has a cinematic look to it and Wood’s script is an interesting character piece for the two central women. Unfortunately, the one element this comic lacks is a sense of threat which is essential for a story in the Alien Franchise. When the Xenomorth’s are reduced to nothing more than pesky insects, like they are here and to a degree in James Cameron’s Aliens movie, they lose their impact. The narrative then requires something else to fill the gap and Wood has not produced that something else here. This may be one of those occasions when the full story is best read in a collected state. 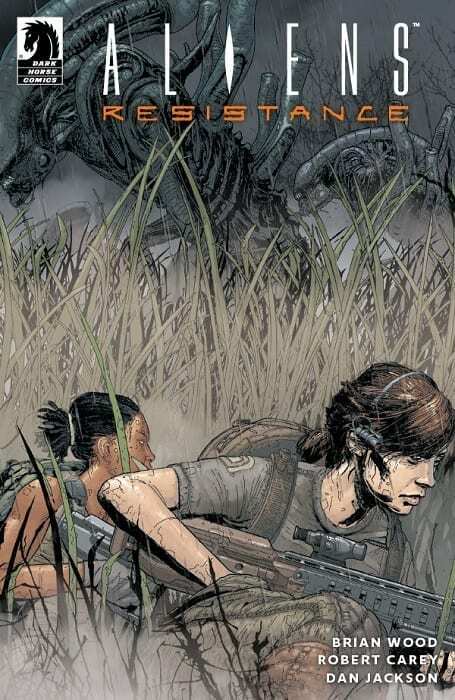 As a single issue, Aliens Resistance #3 has the style but is lacking the substance.